The front end of your signal chain–this is where your tone develops. The first stage of amplification is critical for a sound that has clarity and delivers expressive tone. Compression, Drive, Overdrive, Boost: you get it all here. 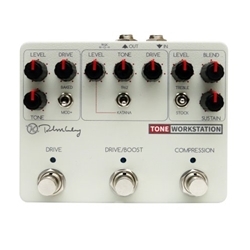 The Tone Workstation is designed to be the first stage in your pedal board. It may even be the only pedal you bring to a gig. And Keeley designed it that way. The Tone Workstationâ€”reinvented, re-engineered and re-released for 2016â€”is the final word on your front end. In 2026, you’ll wished you’d grabbed two.